Source: Currituck County Confederate Soldiers Monument, Currituck. Image courtesy of the North Carolina Department of Cultural Resources. Photo by Richard Phillips. 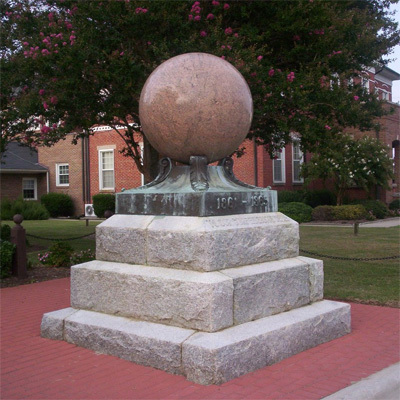 In contrast to the more typical Confederate monument in North Carolina depicting the Confederate Common Soldier, this monument presents the simplicity of a large polished sphere of red granite weighing 2,397 pounds. This simple, graceful orb is mounted on a bronze setting of scrolled acanthus leaves. The entire structure rests on a three-tier granite base. The original planned cost was $1,650. The monument was installed and dedicated in two separate events separated by more than ten years. The installation and dedication of the cornerstone was planned for Wednesday, September 18, 1912 in conjunction with the local annual reunion of the H. M. Shaw Camp of Confederate veterans. A newspaper account of the planned activities reported that the festivities included an invitation for the D. H. Hill Chapter of the United Daughters of the Confederacy to be present along with appropriate services, speeches, and exercises. A "basket picnic" was planned for the courthouse grounds, along with music and an address by Herbert Peele of Currituck. Additional speeches were to be given by Attorney A. M. Simmons, the Rev. A. A. Crater, and Dr. Julian D. Maynard to the glory of the monument, the South, and the bravey of Currituck County. The monument was completed in 1923 with the installation of the granite sphere. The finished Confederate monument has an unusual construction history. The original design featured a Confederate soldier atop an obelisk, similar to many such monuments that adorn courthouse greens across the South. In 1912, Confederate veterans and Captain J. B. Lee proceeded with the installation of the granite base. However the fundraising stalled the construction. In November 1922, Joseph Palmer Knapp, a wealthy New York publisher and philanthropist, offered to improve and beautify the court house grounds and complete the Confederate monument. To underwrite the monument though, he demanded creative control and rejected the original plan of a tall shaft with a soldier statue. According to local Currituck lore he refused "to pay for a damn Rebel soldier." An editorial published in The Elizabeth City Independent around that time suggested that the offer of a Northerner and northern money to complete the monument was a disgrace to local patriotism and Confederate heritage. Knapp owned an estate on Mackay Island, just to the north of Currituck Island where he pursued his passion for conservation and fowl hunting. His philanthropy included donation of money toward the island's schools and he was among those credited with founding the conservation organization that became Duck's Unlimited. Bronze sub-base and granite sphere designed by Farrington, Gould & Hoaglund architectural firm in New York. An editorial published in The Elizabeth City Independent around that time suggested that the offer of a Northerner and northern money to complete the monument was a disgrace to local patriotism and Confederate heritage. The monument is located off Courthouse Road ((State Highway 1242) in Currituck, NC, near Caratoke Highway (State Highway 168), and within the historical and contemporary Currituck County administrative complex. The monument stands just off the road on a brick walkway, in front of the historic Currituck County Jail.